The power of video games put towards the political problem of climate change. This year’s Earth Day has given us a chance to reflect how the environment is more threatened than it has ever been. Worst of all, this is all occurring with indisputable evidence of the causes, dangers, and solutions to climate change readily available. The fact that climate deniers can still triumph in light of vast supporting evidence is not only shameful, it’s surprising. We know the answers for how to address this, why can’t we do so as a society? The reason of course is because climate change is not just a scientific problem, it’s a communication problem. The contortions of reason that are needed to moralize the destruction of our planet are too easy to believe, because the problem takes place across a vastness of time and space that allows for plenty of willful misinterpretation. It’s not a problem you can see happening in front of your face, and it’s not one that immediately threatens you, so it’s an easy one to dismiss. How do you reach people from deciding climate change is false, despite overwhelming evidence? More evidence clearly isn’t going to help, and thanks to the backfire effect, will probably make the problem even worse. Things are different, however, in the realm of experience. There’s a power to what you experience personally above what people tell you; you value the conclusions you come to on your own infinitely greater than those which are foisted upon you. Notably, there is only one medium that provides you with interactive experience, and that is the medium of video games. Within the experiential power of games, I believe we can find some of the power to untie the political knots that wrap up climate change, creating an experience in a virtual world where climate change is a problem you can see in front of your face, and it immediately threatens you. There’s a magic to the world of video games, they create out of thin air these worlds that matter intensely to the player, that are occupied by their friends, that are self-motivating and important to their lives. The value of that is hard to overstate, and it creates an opportunity to reach people that is unique across media. 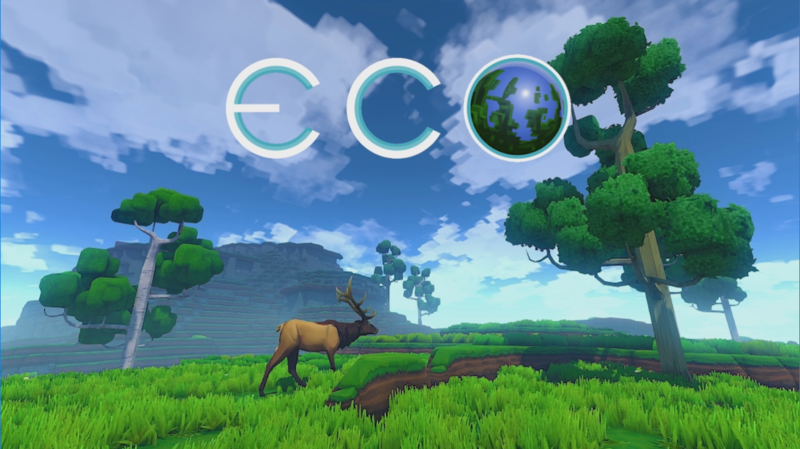 Our game Eco creates a virtual world that you share with your friends/classmates for which you are responsible, created within a simulation of thousands of plant and animals lives, lives which can be impacted by player actions. 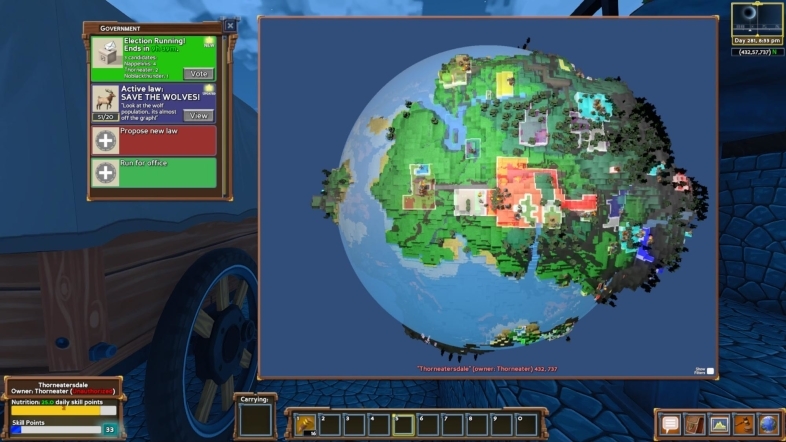 In this game, the oceans can be polluted, forests cut down, the atmosphere wrecked with CO2, species rendered extinct, and food supplies destroyed. Players are capable equally of saving or destroying this world. The key to this approach, however, is in the positioning. Your goal in the game is not protect the environment, indeed the player is incentivized in the short term to do the opposite, with huge gains of natural resources available for the taking. The goal of the game is to build, creating a civilization where all of your resources need to come from the finite supply found in nature. In the longer term, though, the environment comes into play, and if players neglect it and pillage resources without regard to the impact, it can wreak havoc not only on nature but on the society they have constructed which itself depends on nature. By positioning environmentalism in this role, not as goal but as consequence, you allow the player to arrive to it as their own conclusion, through the logical extension of their own behaviors, which is far more powerful than beating them over the head with it. It’s this role as consequence, as an element to their success and result of their actions, that allows environmentalism to escape its characterization as something negative that hampers you, showing it instead within a larger-picture where it contributes to your success. This approach leverages one of the most incredible abilities of video games, to take a real world of such vastness that it can never be completely witnessed, combined with a climate process that takes multiple lifetimes to play out, and compress it into a virtual world in such a small amount of space and time that a small group can witness its effects entirely. What happens so slowly that we get only a still-frame in reality can be rendered in full-motion, lived-in color through a video game. Within Eco, the processes of climate change and societal impact happen over the course of 30 days, with a few dozen friends or classmates, in a world small enough to see all of it. 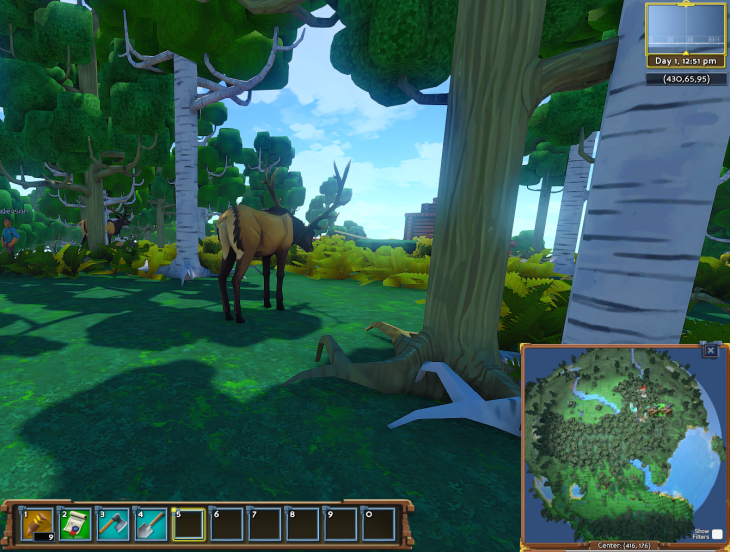 These worlds can have valuable analogs to the real-world, functioning under scientific models of ecosystems and climates and economies that run continuously, determining how the impacts of many players combine into a summed effect on the world, and, critically, sharing that information with the player. 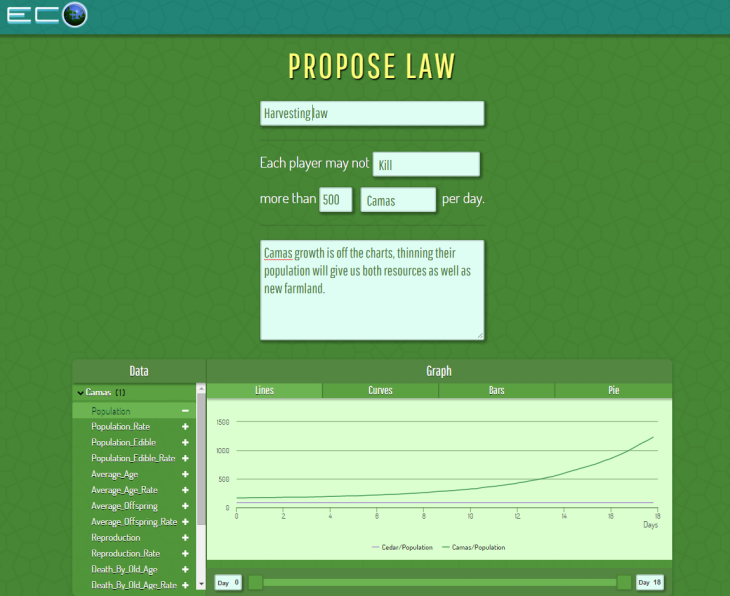 In Eco, the simulation data is exposed to the player through graphs, heat maps, and large sets of data, and a core focus of the game is using that data as evidence to propose laws and systems of governance to your peers, guiding the group to a successful balance of ecosystem and economy based on data. Players are the source of the problems in the game, as well as the architects of the solutions. And in the end, the fate of this world is determined by how well the players are able to overcome their individual biases, agree on problems and solutions and implement them, all within a system where they are highly incentivized for individual success through the selfish harvesting of the environment. Eco is ‘Tragedy of the Commons, the Game’, and whatever the fate of a world it will be sure to be impactful on its players. Either they band together and balance individual incentives to the contrary, saving their world, or they succumb to individual biases, to denial of demonstrable truths, and their world is permanently lost. That vulnerability of the world, the capacity to lose it all, is a gift to the player, the means to see the stakes of the real problems we face through the lens of a virtual one that players immediately feel. 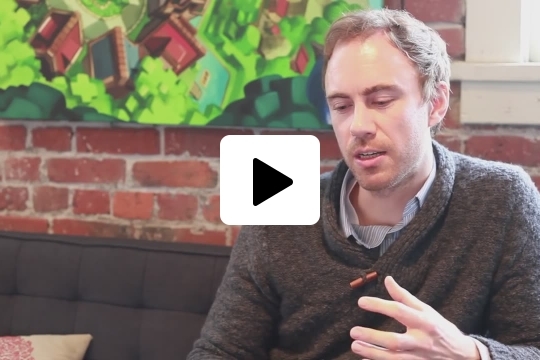 John Krajewski is CEO and Founder of Strange Loop Games, and the designer of Eco. Eco is funded by a Kickstarter and a grant from the US Department of Education, and is currently available to download in Alpha. The article conveys interesting and interesting content, thank you for that. At first, minecraft was reminded to me, but this game is a million times cooler. I, an adult, wanted to play and plunge into this world. I will definitely show this game to my children. Thanks to the developer for creating this game. This is amazing and great article. Thanks for sharing. Thanks for the amazing article. This is really beautiful article. This game is really interesting. I fully agree with Francis, make it freely available and join “open scholarship”. I believe you should make this game free and work on donations. By being behind a paid wall, you are limiting its scope and access. You are preventing the youth, who might pick it up for free to try and play and understand the concepts by gating it behind a paywall they cannot reach without their parents or the generosity of somebody else. I understand development make sense … yet this game should be a free to play title, to allow the message to spread as far and wide as possible. Your biggest and most important audience should be the children and they are the one who cannot access this title readily. I agree. Personally, I am ‘the youth’ and I would certainly get it were it free. I feel that you could very easily get donations if you asked for them, say every time you sold a copy. You could also keep the other packages paid and just have the very basics free. If your hope is to inspire the youth, I see it as much more logical to make it easily accessible to us. Thank you.